Hall of the Mountain King: Review: In Flames, "Trigger"
Rather than just toss out a single for the song "Trigger" on the eve of their U.S. tour, In Flames has decided to treat their fans to an EP with a couple of new tracks. The disc starts out with the single edit of "Trigger," but what I find odd is that they didn't include the album version as well. The song plays smoothly enough, but chunks have been carved out. The new original song, "Watch Them Feed," is an aural assault that will please fans of the band's older work. This song eschews the more melodic touches of their "Clayman" and "Reroute to Remain" albums for old school Gothenburg-style metal. An interesting, and kind of funny, twist is their cover of Genesis' "Land of Confusion." In Flames gives the song a good thrashing, and I think it's a vast improvement. Then again, I didn't like the original all that much. Fans of Genesis will probably be horrified by it. The last two audio tracks, I'm not so sure about. I don't know if they're joking or not by doing a club mix of their last single "Cloud Connected." While the melody of the song lends itself well to the treatment, I'm not really sure I'm ready for Gothenburg dance metal. Likewise, a version of their song "Moonshield" done on a Commodore 64 is a fun lark, but not something I'd listen to regularly. 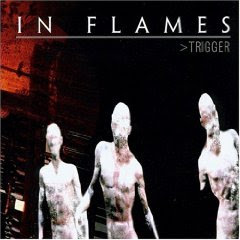 In addition to the audio tracks, the disc also features the videos for "Trigger" and "Cloud Connected." I had to open up Windows Explorer and rummage around a little to find them, but they're there. The band have already begun work on their next album, but won't be able to complete it until touring is done. This is a nice nugget to hold the fans over until then.